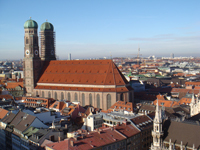 Important information: Our sightseeing tours to Munich can also be arranged starting at locations other than Innsbruck, for instance from Nuremberg, Augsburg, Regensburg, Ingolsburg, Linz or Salzburg. Also, we do arrange city sightseeing tours for groups staying in Munich itself. Beginning in Innsbruck or from a different location, we will reach Munich via the highway (from Innsbruck in about two hours time) and start our sightseeing tour program with a driven city sightseeing tour showing important tourist attractions of the bavarian capital. After a short lunch break, we will join a guided city walk in English with an experienced local tour guide to discover the sights and attractions of Munich's old town, including Frauenkirche, Marienplatz, Marian column, the old and new town hall, Viktualienmarkt, Saint Peters church, the royal residence with its gardens and - of course - the world famous "Hofbräuhaus" beer brewery and restaurant. At the end of the day, you will have the choice between free time for shopping and individual sightseeing or a guided tour to either the old or new art gallery ("Alte Pinakothek" or "Neue Pinakothek").